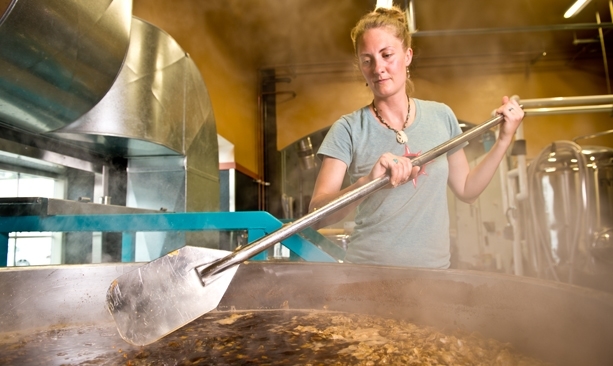 Pollard started home brewing with her father and is one of a growing number of female brewers in Oregon. 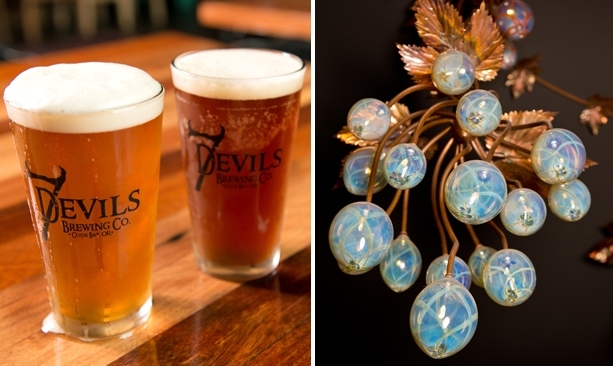 In startup phase, 7 Devils Brewing earned $30,000 from its investors pint program and used that money to commission the work of local artists. Not yet a year old, 7 Devils has become a community hub for Coos Bay. Matthews, chapter chair of the Surfrider Foundation, is passionate about the natural beauty of the area. 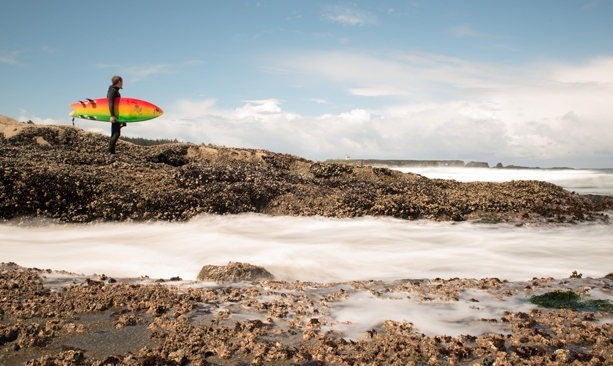 The beaches, trails and surf near Coos Bay are beautiful, rugged and less traveled. Patrons enjoy last call around the fire pit on the 7 Devils patio. There’s a tree at Shore Acres State Park that every local knows. The tenacious spruce clings to the eroding cliff line, its limbs snaking into horizontal angles in a testament to survival in an area known for its tremendous storms. As a boy, Carmen Matthews climbed this tree when his parents took him to the park above the boiling surf. “Every single time,” he said on a recent sunny day, standing at the overlook just outside his hometown of Coos Bay. Matthews knows that a lot of people share his love for that tree, the rugged coastline around it and this former timber town on the South Coast. When he and his wife, Annie Pollard, opened 7 Devils Brewing Company, he commissioned a stained glass panel in the taproom to immortalize the spruce. Locals who walked in the door all noticed. “They all said, ‘That’s my tree!’” Matthews said. It’s that sense of community connection that the couple hopes to foster through their craft brewery. 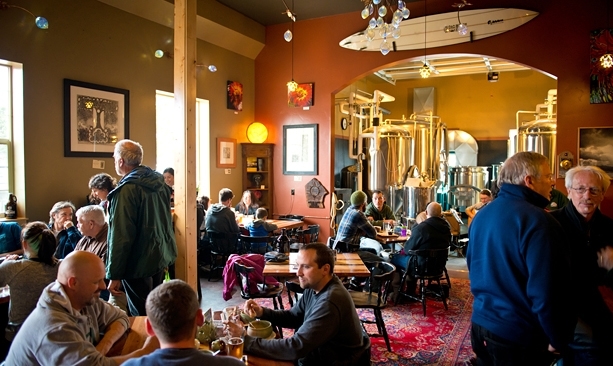 The Coos Bay community, specifically its artists, were a key element in the brewery’s design. “I’ve been surrounded by so many good people (here). I just want to highlight what we do well,” Matthews said. One full side of the building is a hand-painted rendering of 19th century cartographer Jedediah Smith’s map of the area, including the treacherous series of ravines that he named the 7 Devils. The stained glass panel of the Shore Acres spruce divides the room, and an intricate chandelier of salvaged copper and blown glass cascades from the ceiling. The bar, chairs and tables, created out of South American hardwood salvaged from shipping pallets, add warmth and color. These pieces and others were all commissioned from local artists. “It’s not just about craft beer. It’s about craft,” Pollard said. Pollard and Matthews were thrilled to be able to pay local artists for their work, and even more thrilled that the town footed the bill. During startup, 7 Devils offered an investor pint program under which people ponied up $100 in exchange for a pint glass and a free beer twice a week for the first year. The effort raised $30,000. “Every dime of that was spent on art for the taproom,” Pollard said. The two see that act of faith from investors as a declaration of local pride. It’s easy to see why a town would rally around this pair, who married in 2012. Born and raised in Coos Bay, Matthews, 31, is the guy who knows everyone. He worked at a Dutch Brothers coffee drive-thru, where, he said, “You end up meeting everyone in town.” He was regional manager by the age of 23. At 24, he was the president of the Oregon Coast Music Festival, overseeing its 30th anniversary. He’s a rotary club member and the chair of the local chapter of Surfrider Foundation, an environmental nonprofit dedicated to clean beaches and ocean waters. He surfs, plays in a local band and has a long list of artistic interests. Pollard, 31, also shines. 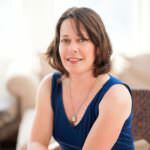 After a childhood in Salem, she attended University of Oregon and spent several years studying climate change in the Antarctic and working for the local marine lab in Charleston. She teaches ceramics at the community college and is an artist in various mediums. Much of her artwork is visible in the brewery — hop blossom-shaped candleholders and pendant lights as well as several drawings. The two met through friends who’d been trying to get them together for years. “I fell in love with a local boy, and I fell in love with this place,” she said. 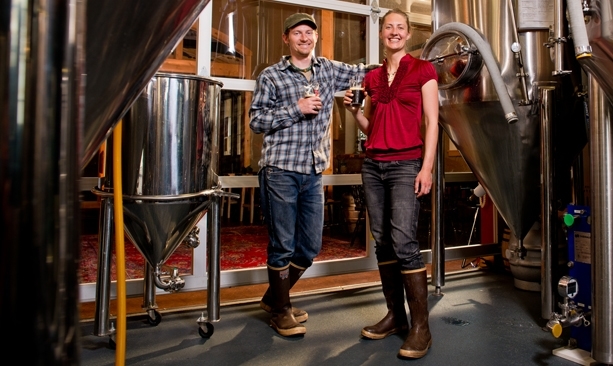 They quickly discovered their shared passions for art, the environment and good beer. Pollard got into brewing with her dad, and Matthews had been home brewing since he’d tasted his first craft beer — Deschutes Mirror Pond — at 21. When traveling, the couple found themselves gravitating to local pubs, and the idea for their own place just kept coming up. They started saving their money and planning five years ago. “It’s great to finally be here,” Pollard said. On a recent day at the brewery, people cycle through in a steady stream, and most seem to be on a first-name basis with the owners. In addition to eight taps running from session to porter, the brewery offers a fresh, tasty menu sourced from local farmers, fishermen and bakers. At night, the restaurant fills with laughter and the clink of pint glasses above the strains of live music from the guitarist playing next to gleaming stainless steel tanks. The crowd spills onto the sun-warmed patio next to the ocean-friendly garden. 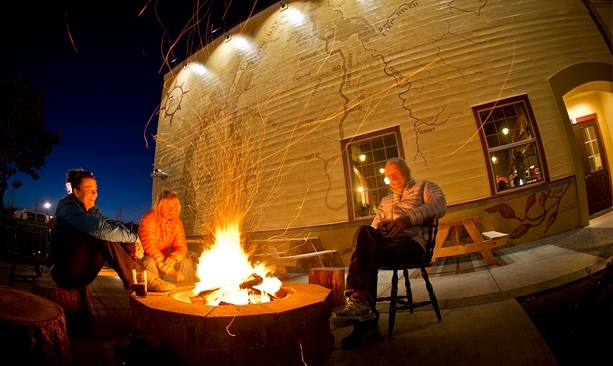 At the end of the evening, a few people linger around the outdoor fire, nursing last call. The 7 Devils owners are clearly pleased to offer a community hub for this place they love so much. “Coos Bay gets lost in translation sometimes,” Matthews said. “There’s a great social structure here. Everybody holds each other up.” They hope that their passion for this town will inspire others. “I’ve always loved the natural beauty of the area, and I wanted to see the town grow in a way that is beautiful and creative,” Matthews said. Extend your stay: After checking out 7 Devils Brewing Company, spend the night at the Edgewater Inn or Best Western Plus Holiday Hotel. (See more lodging options on our Places to Stay page.) 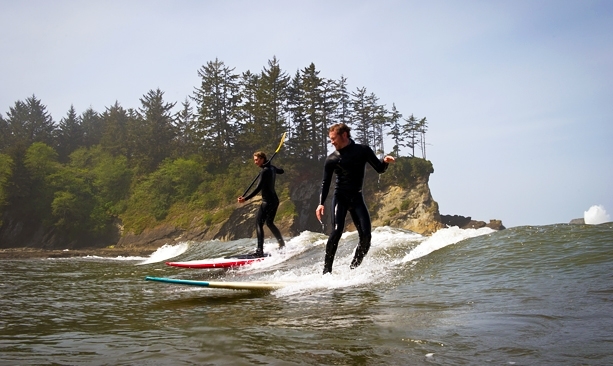 While you’re in the area, check out the many things to see and do in Coos Bay and surrounding communities.